Chizuko Endo has been playing taiko for over 35 years; first with the San Francisco Taiko Dojo, then Osuwa Taiko of Nagano, Oedo Sukeroku Taiko of Tokyo, and currently with the Kenny Endo Taiko Ensemble and Taiko Center of the Pacific. She has performed throughout the world with Oedo Sukeroku Taiko (Tokyo) and the Kenny Endo Taiko Ensemble. She has studied classical and festival drumming styles of Japan as well as gagaku “Japanese Court Music,” serves as a taiko instructor specializing in the Sukeroku and Osuwa styles arranged for youth and adults, and is Managing Director of Taiko Center of the Pacific. Chizuko is also an Artistic Teaching Partner in Hawaii public schools. She has been in short term residency at such schools as Waiau Elementary School (ES), Waiahole ES, Waianae ES, Wailupe ES, Kaunakakai ES, Lanai School. She has offered a 5-week intensive course for grades 3-8 at Punahou Summer School for over 20 years. In 2016, she was honored with the inaugural “Distinguished Alumni” award from the University of Hawaii’s School of Pacific and Asian Studies Department – https://uhalumni.org/news/story/school-of-pacific-and-asian-studies-alumni-gathering In 2017, she was honored, along with TCP co-founder Kenny Endo, with the Japanese Cultural Center of Hawaii’s “Sharing the Spirit of Aloha” award. Kirstin Pauka has been a performance member of the Kenny Endo Taiko Ensemble for the past 22 years and has been an instructor at TCP for over 15 years. As part of her training she has been studying and performing pieces of the traditional kumi daiko repertoire of various Japanese styles (Sukeroku, Osuwa, Hachijo), traditional Japanese festival music (Edo Bayashi, shishimai), and original compositions by Endo-sensei and other members of the ensemble. Kirstin has toured with the ensemble to Belgium, Germany, Japan, and the United States. She has been the recipient of two Hawaii State Foundation on Culture and the Arts apprenticeships with Kenny Endo in 2007 and 2008. 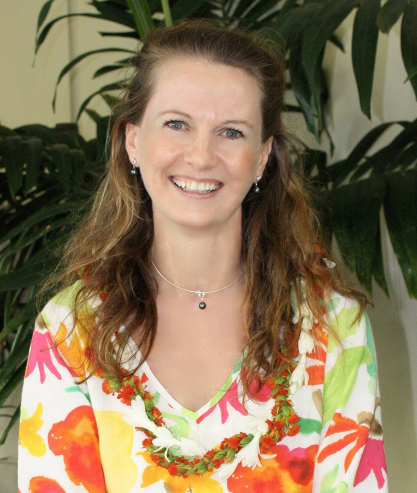 Kirstin is a professor in the Asian Theater Program at the University of Hawaii at Manoa, specializing in Southeast Asian performing arts, and currently holds the position of Director for the UHM Center for Southeast Asian Studies. Brock Asato began studying taiko at age 4 with Taiko Center of the Pacific. He was featured in an HBO special on talented youth focusing on his taiko pursuits. He joined the Taiko Center of the Pacific Youth Group early on and became a central player and leader of the group. He has participated in numerous North American Taiko Conferences taking workshops with such taiko leaders as Seiichi Tanaka sensei, Hiroyuki Hayashida, Shoji Kameda, Masato Baba, Kris Bergstrom, and more. Brock is the Director of the Taiko Center of the Pacific Youth Group and performing member of the Taiko Center of the Pacific adult performing ensemble. Sho’on Shibata is a taiko performer, teacher, and researcher from Fukuoka, Japan. He began playing drum set at age thirteen. While studying musicology at the Crane School of Music, Sho’on was awarded a prestigious research scholarship to study taiko. While conducting fieldwork researching Matsuri Bayashi (festival music) in Japan, Sho’on founded Potsdam Ōkuma Taiko, a collegiate taiko ensemble based in Potsdam, NY. Sho’on was awarded the TCP Fellowship in 2015 and is currently pursuing a master’s degree in Ethnomusicology at the University of Hawaii at Manoa. In addition, Sho’on has also done field studies in of Karnataka Sangeeta in India, Pungmul in South Korea, and Afro-Caribbean drumming in Jamaica. 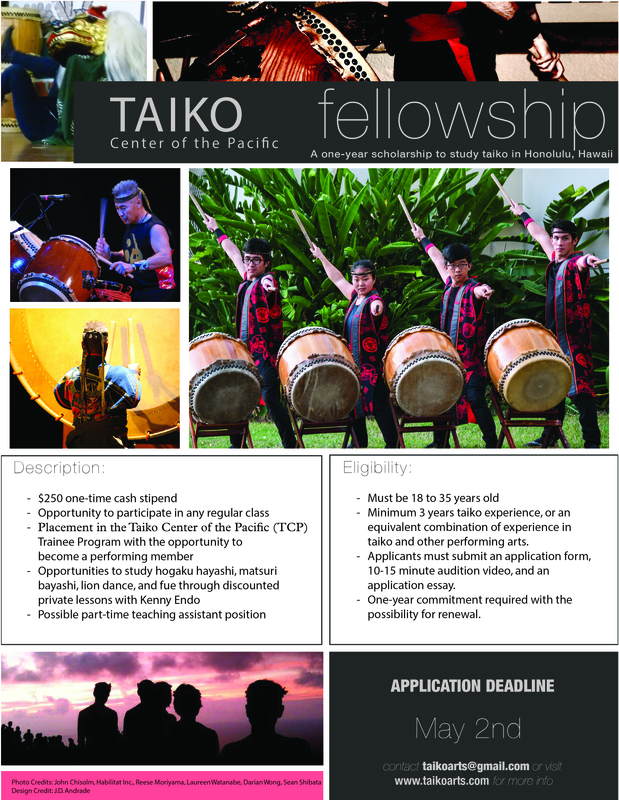 Sho’on is a Taiko Center of the Pacific Performing Ensemble member and also performs with other taiko groups in Japan. Danielle Mihata is a taiko performer and TCP instructor specializing in Taiko Tots and Family Taiko. She began taiko as a young child at TCP, was an integral member of the TCP Youth Group, and has transitioned easily to the TCP adult performing ensemble. She ran a successful and fun summer school taiko program at Webling Elementary School in 2015. Born in Japan, Lucy is a graduate of the Osaka College of Music. She has been involved in many theater productions, TV and radio recordings, and teaching and performing internationally since 1990. She has taught music at many public and private schools on Kauai, including the Kauai Academy of Creative Arts and Kauai Community College. Lucy has much experience teaching young children from the age of 18 months old! She is the director of the “Joyful Noise” taiko group on Kauai and founder/owner of Joyful Noise School of Music on Kauai. She is also the founder/owner of Aki‘s School of Music on Oahu. Lucy is currently training with the Kenny Endo Taiko Ensemble.